We are now in the full swing of Fall and we are quickly cruising towards Winter. The flavours of the moment are warming cosy and sweet flavours, these Chocolate Caramel Apple Oatmeal Bars perfectly fit the bill. Cinnamon and allspice infuse the buttery oatmeal base and crumble topping. Tart apple chunks covered in caramel along with chocolate chips make the filling. All these ingredients come together to give you a wonderful dessert bar that can be enjoyed warm or cold. Whichever way you enjoy them they are a delicious treat. 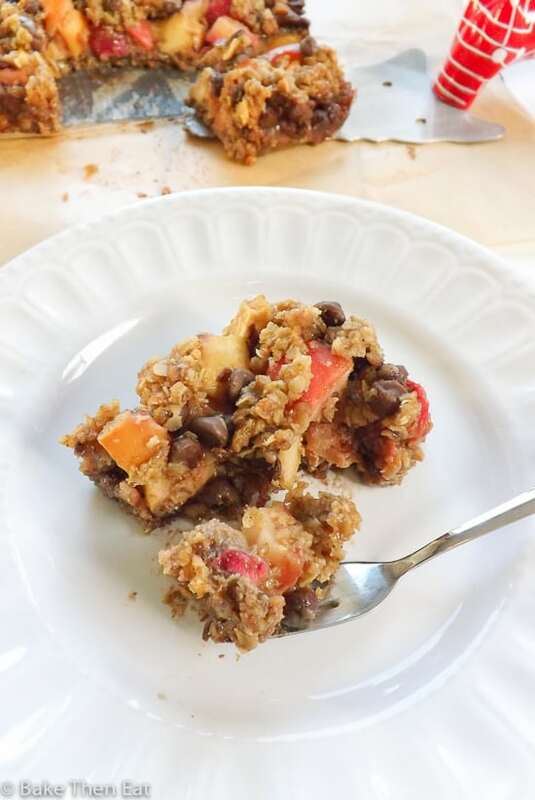 To make the base and topping of these chocolate apple caramel oatmeal bars is easy. There is nothing strange or unusual in them and you can use gluten-free oats if you wish to make these a gluten-free treat. I used a combination of jumbo and old-fashioned oats for a small difference in texture but use what you have in the pantry. Just not quick/instant oats, as they will go all mushy, trust me I tried it! 2/3rds of the mixture will make your base while the remaining 1/3 will be sprinkled over the top. We bake the base off for 5 minutes before adding the filling just to give it a head start to stop it getting the dreaded soggy bottom! 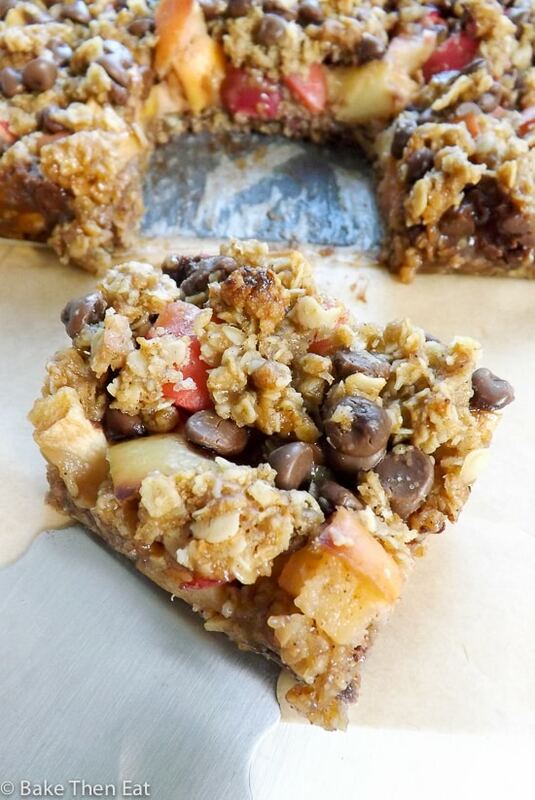 The filling of these chocolate caramel apple oatmeal bars is pretty much as the title suggests. Apple chunks mixed in with semi-hard caramel chunks and milk chocolate chips. I used apples from my garden which are a red dessert apple, but they are crisp and a little tart like Granny Smiths. 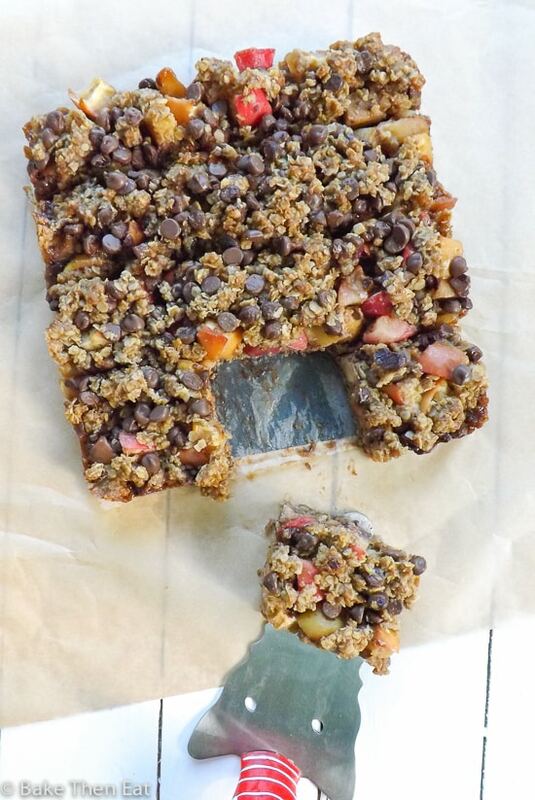 So if possible use a tart apple as they will help balance out the sweetness and richness of these bars. These bars can be a little messy to eat, but that is part of the pleasure of them. They are sticky and sweet and so rich and buttery. And they go great with a dollop of custard on top. 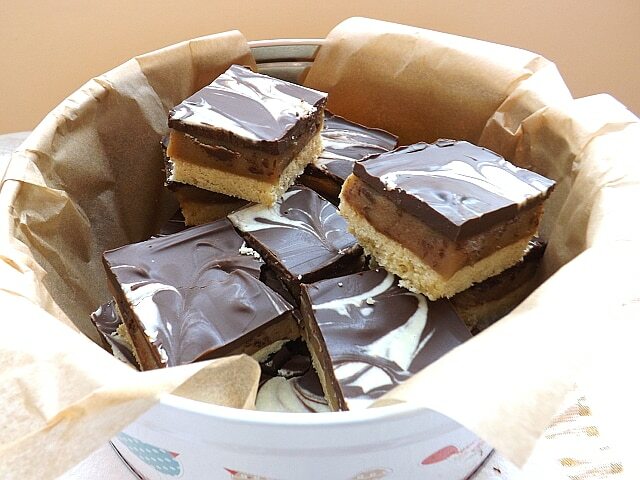 They are quick and easy to make, the only downside being if you wish to cut them into squares then you are going to have to wait a few hours for them to cool down as the caramel needs to reset. If you attempt to cut them while they are still warm they will crumble and become a bit of a mess. They will still taste great and as long as you don’t need to photograph them it should be fine. Chocolate Caramel Apple Oatmeal Bars are loaded with tart apples, gooey caramel and milk chocolate chips. Bought together with a buttery oat base and crumble topping. Perfect for snacking or as a dessert. Preheat your oven to 200C/400F/Gas mark 6 and line an 8x8 inch square tin with either baking parchment or tin foil.Give yourself a little overhang so you can lift your bars out. Mix the oats, brown sugar and spices together in a medium-sized mixing bowl. Then pour in the melted butter and mix until everything is evenly coated. Pour 2/3 rds of the mixture into the bottom of your pan and press it down to create an even layer. Pop this in your oven for 5 minutes. While the base in the oven, quickly prepare the rest of your ingredients. Take the tin out of the oven and place the apple chunks over the semi-cooked base. 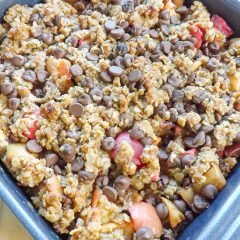 Evenly sprinkle the quartered caramels over the apples and sprinkle half of the chocolate chips over the apples as well. With the remaining third of the oat mixture, crumble it over the top of the filling then sprinkle the remaining chocolate chips over the top of this. Place the pan in your hot oven and bake for 35 minutes. Take the pan out of the oven, the caramel will be bubbling. It's important to leave the bars until they have completely cooled down to room temperature. They will be nearly impossible to get out of the pan let alone cut if they are warm. If you can leave them overnight to cool down all the better. Once cool cut them into either 9 or 12 squares depending on what size you want them. Stored in an airtight container at room temperature these bars will keep for 5 days and they will keep for at least 7 in the fridge. If you keep them in the fridge allow them to warm a little before serving so the caramel softens a little. If you don't have both style oats then use just jumbo or old fashioned instead of a combination of the two. Just don't use instant / quick oats, they don't work too well.Dark brown sugar can be used in place of the light brown sugar. 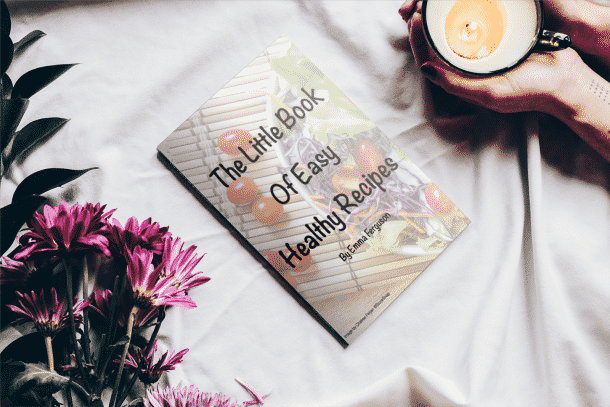 So could coconut sugar if you prefer a more non-refined sugar. I used apples from my garden which are red, but still quite tart. I would use Granny Smiths if I were to use shop bought apples for this recipe. Love that chewy sticky, buttery and oh so good description!!! They look amazing. Sad to say but we would love this for breakfast. LOL Pinning! Don’t worry, I totally had a few of these for breakfast!!! It’s been getting colder and colder by us lately and I am definitely all about cozy treats right now! These bars look delightful! I just can’t get enough apples right now! These sound delicious! I too am also loving all the apple treats at the moment, thanks Kelsie. Beautiful combination of autumn flavours and great that I could make them gluten-free so my husband can have a nice treat too! 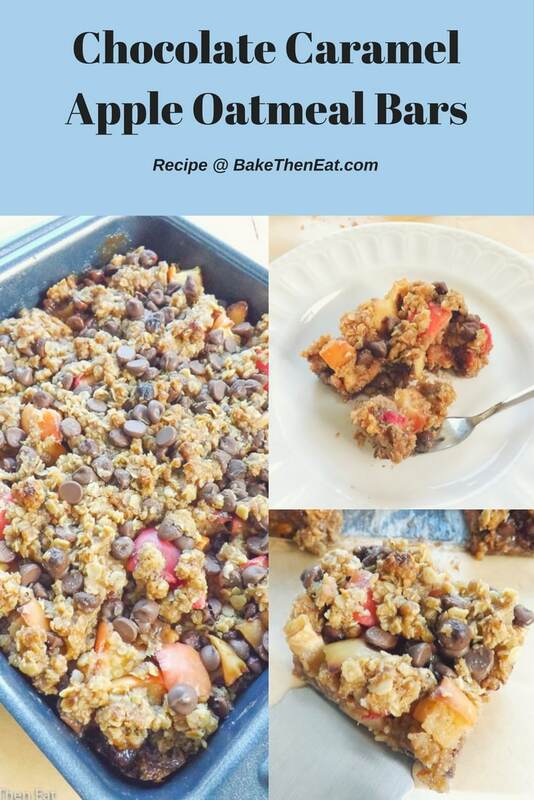 So many of my favorite ingredients in these bars: oats, apples, caramel and chocolate!!! I’m in love!!! Thank you, Liz like you I am a huge apple fan. OHHHHH! I love these hunky bars. I wonder if my husband would like them too – they look like something he should be LOADING UP ON! YUM! 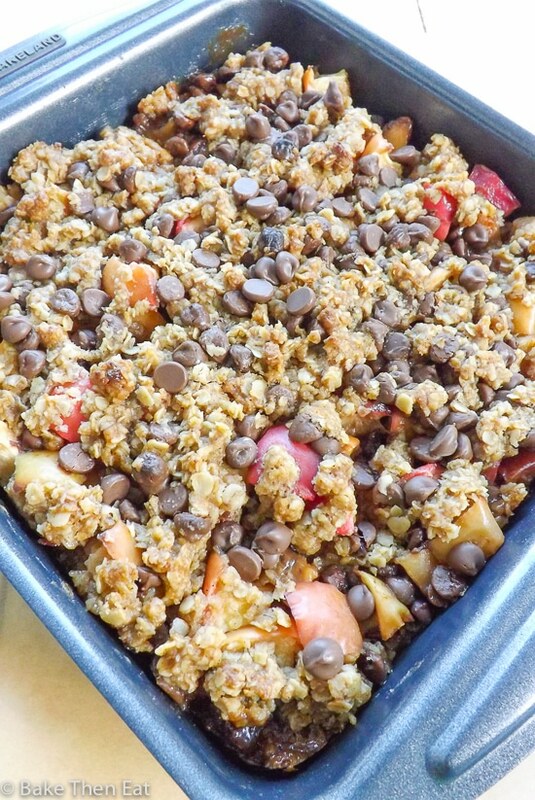 That chocolate, those apples, that oatmeal crumble…drooling! 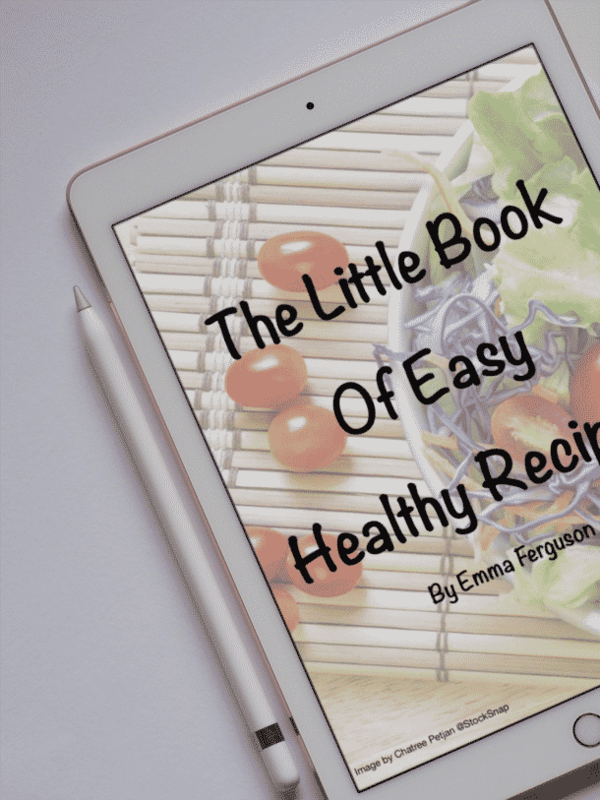 These oatmeal bars seems so delightful and mouth-watering, Emma! Excellent recipe for a perfect start of the day as they seem like an energy bombs. Thanks, Agness, they would certainly kick start any day! Gosh, look at that topping! 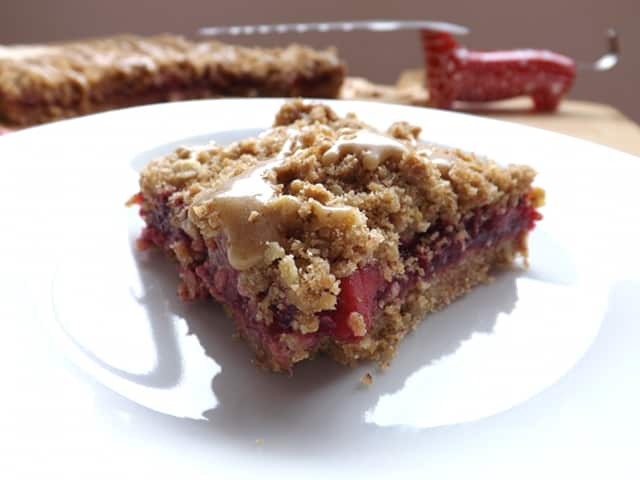 These oatmeal bars look utterly delicious and tempting!